Mac Running Slow after High Sierra Update? Quick Ways to Speed it Up Here! 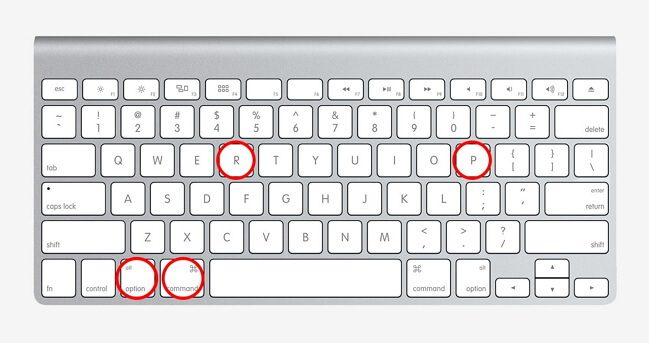 How to Make MacBook Air/Pro/iMac Run Faster after High Sierra Update? With the promise of increased functionalities and better performance, it is little wonder how droves of Mac users opted for the High Sierra, some of the users’ expectations were however cut short as their Mac seemed to run on slow-mo immediately after this update. Should you be among these affected users and wondering why your mac is running slow after High Sierra update, feel free to read this article for proven fixes to resolve this issue. The level of sluggishness experienced by users vary to a great degree and can result in really annoying instances, for example, a user complained of her 2014 i7 iMac running so slow it takes five minutes to load Finder, which is highly unimaginable. Others complained of losing access to some vital parts of their Mac immediately after this upgrade, as applications such as Photos became off limits. Another user complained of his late 2012 Mac Mini taking 43 seconds to power on when he upgraded to the High Sierra, compared to the 17 seconds power up time on his previous Sierra OS, all things being equal. Additionally, a user complained of experiencing this error temporarily on his MacBook Air 11 2015 and it got resolved without his intervention. This problem coupled with a probable reluctance to restore from backup has led to users searching for solutions to the Mac running slow after High Sierra update problem. How to Speed Up MacBook Pro/Air/iMac after High Sierra Update? Unlike the human brain that constantly automatically deletes old and unnecessary data or files, the Mac never deletes a file because it is unnecessary and/or old. File deletion can only be initiated by the user. The flaw of this design is that over time, the limited space hard drive becomes congested and even filled up if nothing is ever deleted. This can be a dangerous scenario for a computer as it hampers performance and could lead to damage, hence frequent decongestion is advised. Decongestion can be achieved via two methods, either manually or automatically. Manually, a user can go through the rigorous process of searching for and identifying all redundant files and documents on his device and deleting them manually. This is very time and energy consuming but can help in addressing the Mac slowing down after High Sierra update issue. Automatically, users can opt for tools such as the CleanMyMac 3 tool that automatically identifies redundant files, hidden or not and deletes them, thereby freeing up space on your hard drive for improved Mac functionality and performance. 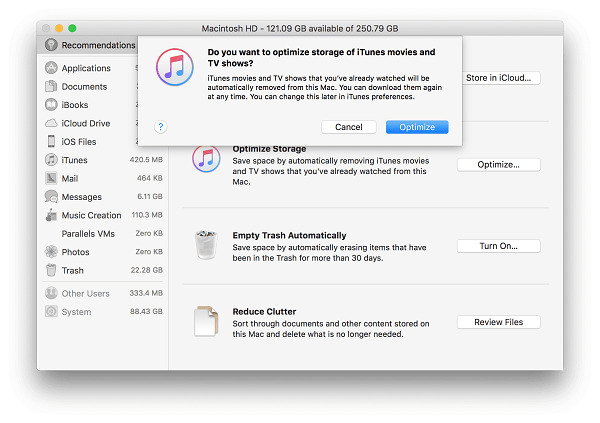 This Optimize Storage feature is one of the subtle yet amazing features Macs sport that other PC’s have in no wise deployed effectively if at all. Optimized storage is an option that permits mac to arrange and organize files optimally and automatically. To access this setting follow Apple Menu > About this Mac > Storage > Optimized Storage. Once this option is toggled On, it enforces Mac to automatically organize files and documents while also cleaning unused, hidden or unread items on your device. It moves them to the iCloud, freeing up valuable space on your drive. Before executing this move to the cloud, it requests permission to clear memory, cache, log etc. which should be granted for it to be effective. 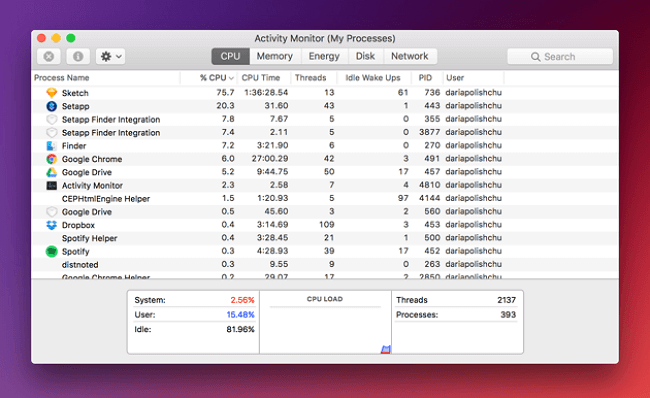 A major reason your Mac might be running slow after its High Sierra update might be that numerous applications are running simultaneously thus consuming vital CPU space thereby slowing down the system. While some applications run actively, others run in the background and also consume considerable space. To recover memory space and resolve this issue, deploy the Activity Monitor. Under the CPU tab, you would see the distribution of CPU usage among the currently running processes. Should you identify an application that is not necessary but is consuming considerable memory space, be swift to eliminate it by tapping it and hitting the close button at the top-left corner of the screen. The Memory tab at the top region of the Activity Monitor should be opened to reveal the Memory distribution among the opened apps. Unwanted apps can also be toggled off to save Memory. The System Management Controller (SMC) and parameter RAM (PRAM) are important tools in ensuring the smooth functioning of the Mac. Reconfiguring the SMC resolves all hardware management issues like fans or battery faults, etc. while reconfiguring the NVRAM handles issues pertaining to booting, screen resolutions and battery charge etc. The mac running slow after High Sierra update is a widespread problem facing many users using different Mac models, however, the above basic hacks and fixes would help your Mac run smoothly in no time. AirPods Won’t Auto-Pair with MacBook Pro/Air? Try the Methods here! How to Fix Mac Recovery Mode not Working on High Sierra?